As owners of many GM vehicles know very well, GM’s and OnStar’s recently-released suite of mobile apps are nothing short of impressive. However, these applications are only compatible with 2011 (and newer) model year vehicles, leaving owners of older models out of luck. But if messages from Twitter are to be believed, owners of older models may soon get the royal app treatment as well. It would be great news if OnStar enabled its apps to function with 2008 model year GM vehicles. Unfortunately, that leaves owners of pre-2008 model year vehicles out of luck. So our question to you, dear reader, is this: how far does OnStar/GM need to go in order to satisfy you as an existing owner of a GM vehicle and OnStar subscriber? Keep in mind that GM and OnStar are in this game as a business… talk to us in the comments. PS: if the above links and quotes don’t do it for you, here are the screenshots of the aforementioned tweets by Mr. Preuss. I didn’t liked the recently released application of GM. This would be a great business move in my opinion, and I’m the very customer to prove it. Just bought a 2008 gmc Sierra and have the trial onstar. Like it? Yes. Ready to buy yearly subscription? Nope. Not until I learned I could get an app to interact with my truck. When it is compatible with my truck, I’ll get my yearly subscription the same day. Until then, no onstar for me. You’ll have my money if you can make it compatible. That’s an interesting point; we’ve usually taken the point of view of the new car buyer when discussing OnStar… Looks like we’ll need to keep used sales in mind as well from now on. PS: keep in mind that we’re not GM, so we don’t make any decisions one way or the next. However, I’m curious to know whether you’ve considered OnStar’s other benefits/features besides the app integration. I’m referring to stuff like OnStar navigation, emergency crash response, vehicle theft immobilizer, etc. Are these not – in and of themselves – enough for you to spring for the subscription? My gm vehicle is an 06 that I purchased recently. I signed up for the trial of onstar and so far I don’t see a lot to keep me. I haven’t played with the navigation but I already have a nav unit in the car. I also have a cell phone and Bluetooth. The one feature that is even remotely useful to me is the crash response but I’m not sure that’s worth the money they’re charging. But having an iPhone app that can unlock my car if I left the key inside, being able to remote start the car or anything else that makes my life more convenient is worth a small premium. If I buy another gm (gotta convince the better half) it likely won’t be a 2011 but showing an iPhone app that could save a call to the tow truck would definitely go a long way in making the case. would get OnStar in a heart beat if I could remote start my 2007 Hummer H2. Alas I will more than likely go with a Viper system. This is my conundrum. You say is a hardware limitation….How do the onstar rep’s unlock your doors and do all their magical things on their end? To me it would sound reasonable to assume they use SOFTWARE to do this….which would then make their claim of “hardware limitations” invalid. It sounds to me its a programming issue, as in they dont want to invest the time and money into making it work for 2010 and below models. I just purchased a 2010 silverado, the fact that the dealership bragged about this app and using it for my truck and come to find out it doesnt work is a different story i guess….. However, I’m not gonna pretend to know the inner-workings of OnStar – so I can’t comment on whether their claim of “hardware limitation” is valid… but I will compare what’s happening here to another revolutionary consumer product – the Apple iPhone. For example, when the iPhone first came out four years ago, it cost $600, had 4GB of storage, couldn’t do multimedia messaging, had no app capability, couldn’t run Bluetooth audio, couldn’t run apps in the background, couldn’t record video, and couldn’t connect to a Microsoft Exchange server. Fast forward four years to present day. That same original iPhone, if purchased four years ago, is not capable of MMS, background apps, can’t do bluetooth audio, and doesn’t have video recording – today. However, Apple has been kind enough to add some software features to that original phone by ways of software updates… that said, not all features are available to buyers of the new iPhone 4 are available to users of the original iPhone. So what does this mean? Well, that’s is called progress. Sometimes legacy (old) products need to be left behind for the sake of progress. From a technological perspective, not all tech can always be backwards compatible with prior tech: it’s sometimes necessary to break all legacy ties and “start over” – rewrite, rethink, and restart. Innovation can’t take place if – at the invention of every single new and revolutionary idea – one has to stop and think: “it doesn’t work with old technologies… so I shouldn’t do it.” If that were the case, the brilliant scientists and engineers that make such useful yet complex products such as OnStar and the iPhone would never release their work to the public! Now, whether the OnStar updates are so revolutionary as to not be compatible with the older hardware and new infrastructure is unknown (to me). But at the end of the day – just like Apple – GM and OnStar are innovators. And if it means that ONLY buyers of new models can enjoy the fun, then that’s the cost of admission. Would I be pissed if I just bought a 2010 GM vehicle and found out the apps don’t work with my car/truck? Hell yes. But that’s the price I pay for getting a discount on a non-2011 model. That’s the trade off. Onstar has come a long way they finally have a service that I actually would pay for and keep past the free trial period with the phone app. However too bad my Denali is a 2010 which I love. I was sooo disappointed when I download the app to my phone. For me 2010 is the magic age since I have a new 2010. What I think they should consider is offering something like they did when they switched from analog to digital OnStar hardware. OnStar/GM offered, for a fee, to upgrade the hardware in my 2003 if I wanted to continue the service. Wonder if there is a reason they aren’t considering something like this. But how do we know that they’re not working on something like this? Or that they may offer this for free instead of for a fee? I realize how anxious it must be to wait for these things (and news about them) to spread — but once all is said and done, it will be worth it! My wife and I drive 2008 and 2009 GM vehicles and have Onstar subscriptions, and have for many years with our previous GM vehicles. We would love to have this app available for our vehicles. As far back this should go to older models, I think it may be limited to a certain generation of Onstar hardware that is compatible. We are at gen 9 now, I think, with 2011 models, so maybe any later (digital) version. Complete agree, David. I know they’re working on getting it to 2010 model year and older vehicles — and I guess they can offer a retrofit kit for those older models for a fee. I just hope that they don’t hold back future innovations for the sake of backwards compatibility. Just thought I’d toss out the fact that today I decided to test the OnStar app (again!) with my 2010 Tahoe – it works! And it works great! All the other times I got a messages saying there were no compatible vehicles on my acct. and today it’s working! Test your 2010s, people! That’s great news — we should let everyone know by writing a blog post for GM Authority! Woohoo! If on-star doesn’t update the app to work with my newly purchased 2007 Yukon then I do not plan on starting a contract w/ them after my 6-month free trial w/ them. No point, my insurance & portable jump-starter/compressor/jack does all that I would need standard on-star for. It’s not about updating the app, it’s about updating your vehicle. And that — most likely — won’t happen. Was the iPhone even out in 2007? No i don’t believe the iphone was, HOWEVER, the Ipod Touch WAS. The later released 2007 Ipods with higher GB capacity WERE equipped with with Wifi and bluetooth options, as were every Ipod touch thereafter. I love the app. Just got my boss set up on his new truck. So, he buys a new truck because I sent him to buy a chevy. Now he gets a mobile link to his truck but I can’t with my 2008 Tahoe even though I have been a loyal ONSTAR customer for years? That just does not seem right. Come on ONSTAR…take care of your loyal customers first or they just may not be sending you new ones…..
Ann — it’s awesome that you turned your boss onto Chevy and OnStar! As far as I now, the compatibility with the 2008 Tahoe is in the works. Let me reach out to OnStar for an official answer. 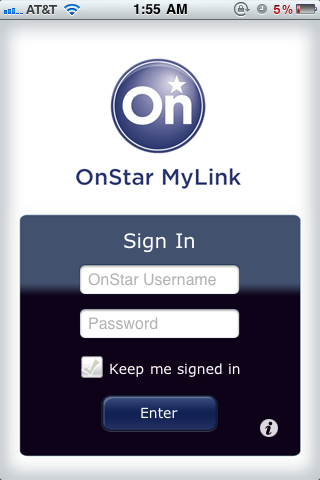 I am planning on buying a 2007 Suburban, I would only sign up for onstar if I could use the mylink feature. Otherwise onstar does nothing for me. I have a cell phone, I know where I am going, I have insurance. So I hope somebody from onstar reads the interweb. I have a 2003 silvarado and have never activated my onstar. I never once considered it a worthwhile expense until I heard about the new mylink. I am very disappoonted to learn it will not work for my vehicle. I would gladly pay the annual fees if the app worked on my vehicle. I am sure there are many others out there like me who feel the same way. That could be a huge market influx of older vehicle owners for onstar. I guess I will keep my fingers crossed. Yeah, you can probably forget about ObStar MyLink making its way to a 2003 model year vehicle. However, I’m a strong supporter of the idea that GM and OnStar should make available an aftermarket compatibility kit that would give owners of models with last-generation OnStar hardware access to the new functionality. I’d also bundle 6 months of OnStar with the kit. If a user is already a subscriber, they get a free 6 months added to their subscription. If they’re not a subscriber, the 6 months gives them a chance to try it out (since they already spent the money on the kit). besides the app integration. I’m referring to stuff like OnStar navigation, emergency crash response, vehicle theft immobilizer, etc. Are these not – in and of themselves – enough for you to spring for the subscription? My 2007 Suburban has the same features of the 2010 including remote start, keyless entry ect. I can’t believe that the options that Onstar has such as starting and openeing my truck would not work with a mobile app. I understand not working for the 2003 models but I bought brand new with 0% and still owe about 12 more payments. My truck still looks and runs like it is brand new. The only feature that I could see being an issue would be showing the fuel level but even that is tracked by the onboard computer. I can go online and see what my tire pressure is at anytime and how long before I need another oil change. It seems if the functions of your vehicle can be controlled by Onstar then the app should also work. Own a 2007 Silverado, have onstar subscription but it’s a little stale and not really worth the money now, especially if they they don’t fresh’n up the service… Even more so now with this tough economy I wonder why I should even keep paying for a service that they won’t even include upgrade’s to handle my model year but keep taking my money… GM are you listening? OnStar as it exists on my 2008 GMC Sierra is cool technology but it doesn’t solve enough problems for me to make it worth the subscription. I’ve had OnStar on virtually all of my vehicles since 1999 but have never gone beyond the one-year freebie. And…I’ve never needed any of the OnStar functions. BUT…if MyOnStar would work with my 2008 Sierra, I’d re-subscribe. Otherwise, my iPhone and a tire gauge covers virtually ALL of the OnStar functions I’d need. Howard, I think the OnStar feature that many miss (or don’t take into account until it’s actually needed) is Automatic Crash Response. When you’re physically incapacitated after an accident (or maybe even unconscious) — along with your phone, which either flew out the window and landed in the ditch or hit the dash and is now in pieces — OnStar’s Automatica Crash Response is — literally — a life saver. Having been in such a situation (but without OnStar), that alone is worth the measly $30 a month to me. You can’t put a price on life. I agree that the Automatic Crash Response is worth all the money in the world. But the subscription is the same price for the person that gets to use there iphone app. No discounts are offered for the people that can’t get the FULL use of OnStar, like the ones with the newer vehicles. I have a 2007 Yukon Denali with all of the same features as the Cadillac Escalade, looks and runs like a brand new vehicle. I’m sure that a programing feature or kit for the older models can be used. I know it takes time, but I think GM and OnStar are sleeping on this…. Dan — there may be, depending on when you check the compatibility guide last. I haven’t seen any recent comments lately regarding the availability of the MyLink app for older vehicles and was wondering this: Now that FamilyLink is widely available as a web based product (at an additional $4/month, I believe) to give the location of our vehicle, why can’t that technology also provide those of us with the digital-based equipment (not sure which generation hardware that would be, but I believe it is found on most if not all 2007 and up GM vehicles) the features of the app, such as door lock/unlock and remote start? It’s appearant that Onstar has the systems in place to allow those of us with older vehicles to contact our vehicle (through FamilyLink web page) and request it’s GPS location without going through an Onstar Rep. (do they even provide that info?) How difficult would it be for Onstar to add the app’s features to the FamilLink web page? I subscribe to Onstar and Familylink and appreciate what they both have to offer. That’s definitely an interesting question, Victor — thanks for brining it up. As far as we’ve been told, the features that allow for the automated (non-attended) features of RemoteLink remote-start, door lock/unlock, etc. must communicate with gen. 9 OnStar hardware in the vehicle… my question, though, is whether OnStar FamilyLink works in/for vehicles that are not equipped with generation 9 hardware. Perhaps that’s a question I better ask of OnStar themselves…. Thanks for your comment, Alex. Just to let you know, I have 2007 Tahoe, which does not have the gen 9 hardware and the FamilyLink works great. I can request location of vehicle anytime and often as I like. The only drawbacks I have noticed so far is that it is not real-time tracking and if the vehicle is in motion, the service returns the address of the vehicle the last time it was stationary until it stops again for a period of time that I have not been able to determine yet. FamilyLink is not feature rich at all but has great potential for giving us GM owners of older vehicles the ability to control other functions. Perhaps with time we may start to see the features added?